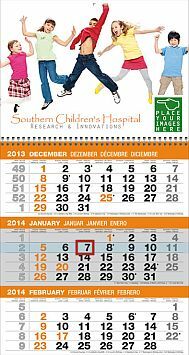 One of the many different styles of calendars available is the Multi-Month View style. Several months are displayed at once for quick reference. Shown here are samples of 3-month, 4-month, 5-month and 6-month per page styles. Additional custom calendars with multi-month view are also available. Practical for logistics and planning. Contact us for specifications and with your requirements. With or without date slider, Stapled, Tinned, Spiral bound, these Multiple Month View calendars can be customized to your specification. These calendars are a great asset and advertising vehicle for all businesses small and large, promoting their services and products all year round. Contact us with your calendar details and questions. 3-month View, Wire-O-Bound, Direct-on Picture with Tear-off Pad. Full color printing on one side of Header. Two color printing on one side of pad (Black + PMS) , Full color printing on the drop ad.